A Terminus located in The Last Bastion. 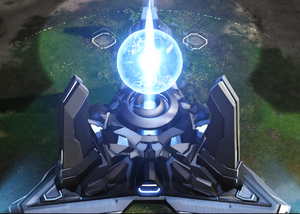 This Forerunner structure is a vital node in the Ark's defences and must be preserved at all costs. After the Halo Array eradicated the Flood threat and the Forerunners disappeared, the Ark lay dormant and untouched for millennia. When the Human-Covenant War spilled over onto the Ark, the installation's threat assessment systems began an exhaustive recording and indexing of events in an effort to anticipate dangers and prepare adequate countermeasures to deal with similar challenges in the future. These threat assessments compare modern battle records against all catalogued historical conflicts, cross-referencing them with updated information and calculating probable outcomes. The systems performing these assessments are powered by the Terminus structures, the loss of which could result in the corruption of centuries of analysis, compromising the Ark's long-term ability to defend itself. A render of the Terminus, viewed from the top. A render of the Terminus. A Terminus under assault by Abominations.